Lake Minnetonka Association: Have the Milfoil Treatments Worked? Have the Milfoil Treatments Worked? To review, the Lake Minnetonka Association in cooperation with others, initiated a bay-wide milfoil control program in 2008. This program involved three bays (Carmans, Grays and Phelps) in 2008, then Gideon and St. Albans Bays were added in 2011. 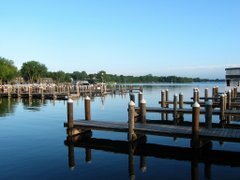 The program is guided by Lake Vegetation Management Plans, which are approved by the MN Department of Natural Resources. The program has several objectives, including controlling milfoil to specified levels, protecting native plants and minimizing lakeshore clean up of milfoil fragments. This program has benefitted from the participation of the US Army Corps of Engineers who have provided expertise, detailed monitoring and evaluation. Most of the results I report here are from their technical reports. Have the treatments controlled milfoil? Yes. We have evaluated the ‘frequency of occurrence,’ which means the percentage of sampling points with milfoil. Prior to the treatments, milfoil covered over 60% of each bay. Following the treatments, milfoil covered has been substantially reduced – in some cases to zero. The results, however, have varied. In the first year, 2008, the herbicide concentration was too low or had dissipated too quickly and the treatment effects were poor. Since then, we have modified the herbicide concentrations and timing so that this year (2011) we have met the program’s objectives of less than 20% milfoil coverage in the treated bays. Another indicator of milfoil control is the overall abundance or matting amounts, which have visibly improved. No objective measures of this aspect have been included in the program; however, there are other positive indicators worth noting. For example, lakeshore owners on several of the bays have noted an increase in water-related activities, such as skiing and tubing, where these were not even possible previously. In addition, I have received hundreds of comments regarding the lack of matting among all the bays. Many will recall that major portions of Grays and Phelps Bays had previously been unavailable for any kind of boating. The photo shows Gray Bay in August of this year, the third season following the last treatment, with no matted milfoil evident. Have the treatments protected native plants? Yes. The plan called for evaluating the number of native plant (measured as average number of species per sample point). In every case, except Grays Bay in 2009, this average remained the same or increased following the treatments, again meeting the plan’s objectives. This number decreased in Grays Bay in 2009; however, it is not clear this decrease was related to the treatments as native plants decreased in untreated bays that year too. Our members have consistently reported substantially less shoreline clean up in these bays, sometimes no clean up at all. The lakeshore residents have contributed nearly a half million dollars to support this program and there have been requests to expand it to additional bays. Is this program a silver bullet? No. This program is clearly effective and has met the objectives of the project. However, there are challenges, including the need for (and aptness for) consistent public funding. To-date, private, voluntary contributions have funded 60% of this project, which benefits a public resource. The treated bays are now useable by everyone. Is the herbicide program safe? Yes. The herbicide products are allowed for use by the US Environmental Protection Agency and permitted for use by the MN DNR. We are aware of no objective or authoritative evidence or reports of any ill effects resulting from this project. Is the project cost-effective? Yes. We have now narrowed to a reliable treatment program that costs about $500 per acre and is effective for two years (perhaps more). This is about $250 per acre per year, which compares to about $300 to $350 per acre per year for the harvesting program. So, what next? We think this is a viable, valuable program worthy of continuation and expansion. Thinking ahead, it is technically feasible to treat the entire lake! An entire lake treatment is estimated to cost less than $3,000,000. Lacking the re-introduction of milfoil from adjacent bays, I would expect a whole-lake treatment would last at least three and up to five years, representing a cost of about $100 to $170 per acre per year. While perhaps not ready for formal consideration, we are encouraged that this scale of treatment is possible. We thank all the supporters of this treatment program and have been encouraged by the positive results. We are looking forward to ridding more bays of milfoil problems in the future.